What is your Nerf gun preference? I have learned more from my own mistakes than I ever learned in school. Not that I didn’t learn anything in school, but I’ve never forgotten the lessons I’ve learned from spending my own money or the more precious asset, my time. In mentoring start-ups, inevitably the discussion comes up about Nerf gun preferences. Seriously, my reader, I’m serious. I know, it sounds like I’m not. I often gauge my future prediction of success based on WHEN the question comes up, not if. There is no proven process for start-up success, just a lot of proven things that create failure. I’m talking real failure here, relationships destroyed, money gone and ideas decimated. Mistakes, instead of true failure, in a start-up provide opportunity to ‘pivot’, change the direction based on something you learned, either by listening to customers (preferred) or by doing and figuring out what didn’t work. Ok, back to Nerf guns. A team of people come together believing in an idea. Typically, it is grandiose and then in short time it gets narrowed down to the intersection of (1) what can be built, (2) what is needed by customers and (3) what can make money. This now 10 year old drawing from Alan Cooper sums it it nicely. If the team starts talking about Nerf guns before they have identified this critical intersection, they are done. 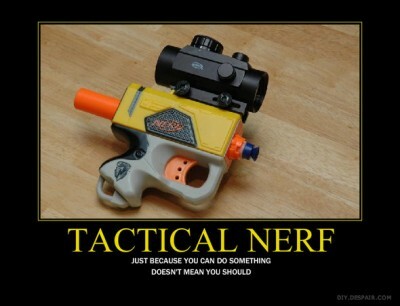 As important, if there is never a discussion of Nerf guns, it often fails too. More simply, start-ups require both a legitimate product and a cohesive team, one without the other, fails. The kind you can’t pivot from.